Sandwich and salad preparation refrigerators allow you to keep all of your prepped ingredients easily within reach, making it easy to assemble dishes. Pizza preparation refrigerators have a convenient surface for assembling your pizzas as well as a refrigerated area where you can store your pizza toppings. Prep tables allow you to keep your ingredients close on hand, which makes it convenient to assemble sandwiches, pizzas, and salads, so you can get orders out to your customers faster. We also carry pizza and sandwich prep refrigerators in a variety of sizes, styles, and configurations, making it easy to find the right option for your business. As an added bonus, our prep tables have additional storage below where you can store prepped ingredients to refill your food pans when they’re running low. For more convenient refrigeration equipment, check out our pass-through refrigerators, undercounter refrigerators, and commercial blast chillers. If you're wondering where to buy refrigerated prep tables, we have a large selection of refrigerated prep tables for sale at the lowest prices. Avantco pizza prep refrigerators will make it quick and easy to craft your gourmet pizzas! Watch this video to learn all about their various features, from their powerful refrigeration systems to their spacious cutting boards. 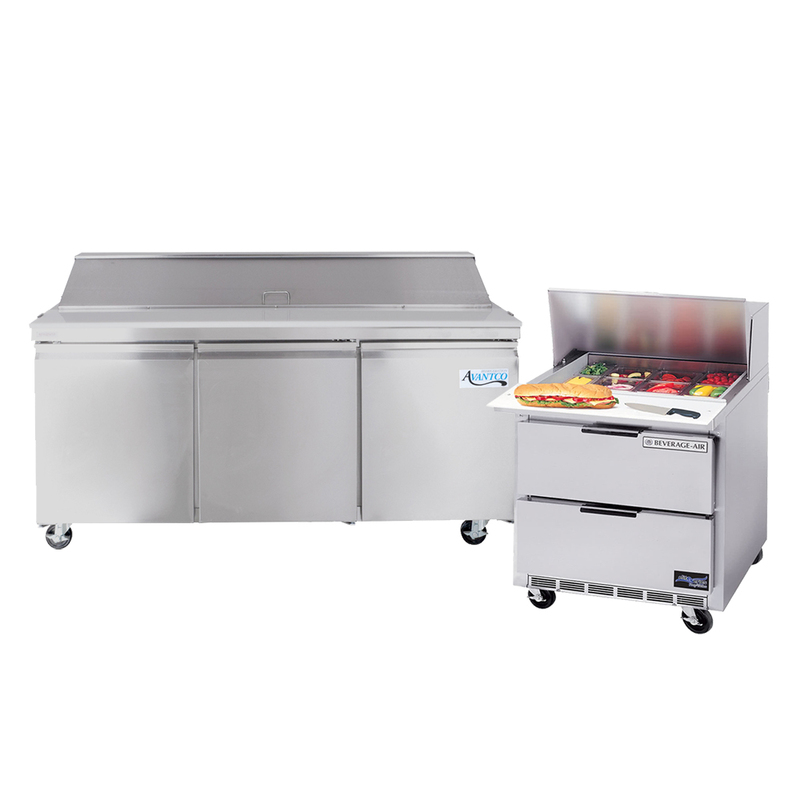 Refrigerated prep tables are the perfect option for assembling sandwiches, salads, burritos, pizzas, and more. These products have a refrigerated well where you can store prepped ingredients, keeping them cold and fresh. Our prep tables also feature a cutting board that runs the length of the refrigerator that you can use to assemble your sandwiches or pizzas easily. Additionally, our versatile and convenient prep refrigeration is essential for a variety of establishments, such as pizzerias, sandwich shops, fast casual establishments, and fast food franchises. 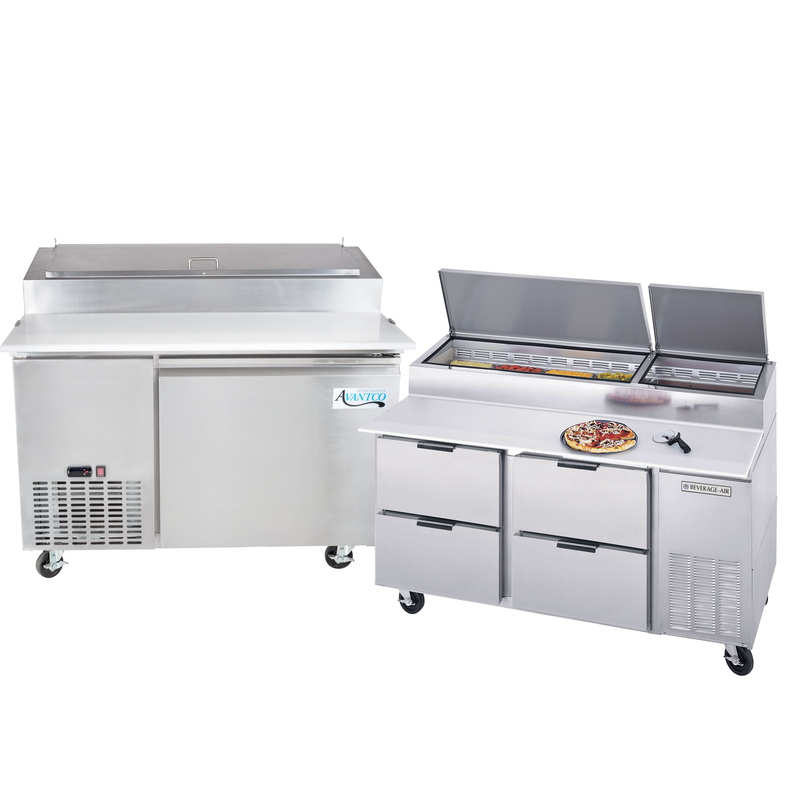 Our selection of prep refrigeration includes both pizza prep tables and sandwich prep tables. Sandwich prep tables have a refrigerated well that is recessed, so you can easily access the ingredients. On the other hand, pizza prep refrigerators raise the ingredients up above the cutting board, which makes it easier to reach the ingredients in the back of the refrigerator. Additionally, both types of prep tables have refrigerated storage below the cutting board where you can keep extra ingredients or other prepped foods. We offer pizza and sandwich preparation tables in a variety of sizes and capacities, so you can easily find an option that meets your business’s needs. With these products, you can also adjust the layout of your refrigerated section to accommodate different sizes of food pans. 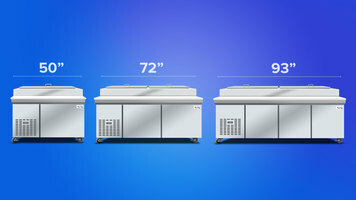 In addition to full-size foodservice establishments, our prep refrigeration is perfect for food trucks because they have a place where you can assemble food as well as storage.